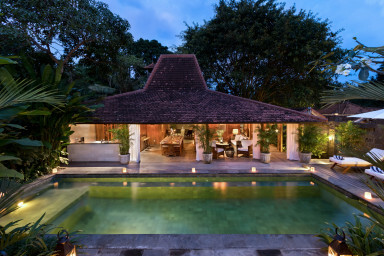 This five-bedroom villa in Canggu is simply stunning and perfect for a family or a group of friends wanting to experience Bali in pure luxury and style. Covering an area of 700 square metres, Villa Maquette is the perfect hide-away from the hustle and bustle of Canggu, yet only a short drive from the best surfing beaches, bohemian shops and hipster dining hangouts. Built almost entirely out of wood, the villa’s beautiful rattan furniture and white furnishings give it a truly unique retro-modern atmosphere. The large living and dining area follows traditional Indonesian architecture. Its half-open design allows for maximum airflow and provides a wonderful opportunity to experience the special comfort of outdoor tropical living. There are four large air conditioned king-size bedrooms. Each bedroom follows the villa’s warm wooden theme and comes with a large semi-outdoor ensuite bathroom with stone bath tub and separate shower. The bedrooms also have an additional private seating corner. The separate TV room has a sofa bed which acts as the fifth bedroom in case you require additional sleeping capacity. The garden is wonderfully lush and tropical. Its large private pool provides a lovely focal point wherever you are in the villa. This is a great spot for sunbathing or alfresco sunset cocktails and dining. The large modern kitchen is fully equipped and is perfect if you love cooking. We’d very much recommend you let our private chef take care of the cooking instead, so you can focus on fully enjoying your holiday. At an additional cost she’ll prepare you the most delicious daily breakfasts, lunches and/or dinners. She’ll also gladly throw in a little masterclass in Indonesian cooking – perfect if you want to impress the crowd back home. We stayed in Villa Maquette for 6 nights. It is as beautiful as displayed on the pictures, maybe even more! The villa has such a nice, special aura, the architect uses lots of woods, which creates a very cosy atmosphere. So different from the concrete buildings of our everyday city life! Our stay was made even more memorable by the lady of the house, Yeni. She is such a nice and helpful person, we would return even just to meet her again! Thank you very much! Was a beautiful experience and villa (even the early morning animal wake up calls grew on us!). Yeni was great in looking after us and making sure everything was taken care of. The only issue is getting transport to/from Villa. Best if you can line up a local driver and just message him when you need to be picked up/dropped off. Also, mention the villa is near JungleRoom. A lot of drivers find it hard to find. Great spot to relax with loved ones. This villa is everything it promises online and more, a wonderful private sanctuary away from the hustle and bustle of Canggu. The heart of this beautiful Villa is the wonderful housekeeper Yeni and she really made our stay so special. Her breakfasts are just wonderful her omlettes especially! Nothing was a problem for her and her team of lovely people who look after this place during our stay. The property is kept beautifully and all the facilities are wonderful, lovely private bedroom means the property is perfect for ant group. Thank you Yani and the team for such a wonderful stay. What an awesome villa - we could want for nothing more! Our family stay here was wonderfully relaxed with Yeni extremely helpful with and around every little detail. It was perfect and we can not wait to return sometime. We rented a 5 bedroom villa, and got to know upon our arrival that if we are more than 6 guests, we need to pay additionnal 35$USD/person/night : what is the concept of having 5 bedrooms ? On top, the rented price was already expensive (more than 220€/night). That's not all : the water of the swimming pool created loads of allergy to all of us -> we didn't go to the pool during our stay. Very bad, being on holiday in Bali. Plus many other small details, i would not recommend to go to Villa Maquette. i'm going to Bali for last 5 years, 2 times a year, renting villa in different places, never had such a poor experience.